George Alan Swanson (1908-1968) was a New Jersey-born painter who achieved international success with his 1940s-era depictions of dancers of the Ballet Russe de Monte Carlo, the Ballet Theatre and the Jooss Ballet. When he put all artistic endeavors on hold to join the war effort, 50 of his Ballet Russe paintings were loaned to the Museum of Modern Art in New York City. On Thursday, January 19th, Shannon’s Fine Art Auctioneers will offer 24 paintings from the estate of Mr. Swanson, in an internet-only auction that begins promptly at 2 pm Eastern time. Included will be watercolors portraits of some of the most famous ballet stars of the 1940s and 1950s: Igor Youskevitch, Alicia Marakarova and Sergei Temoff. The dancers are depicted performing famous ballets, including Baisier de la Fee, Les Sylphides and Le Lac de Cygnes. 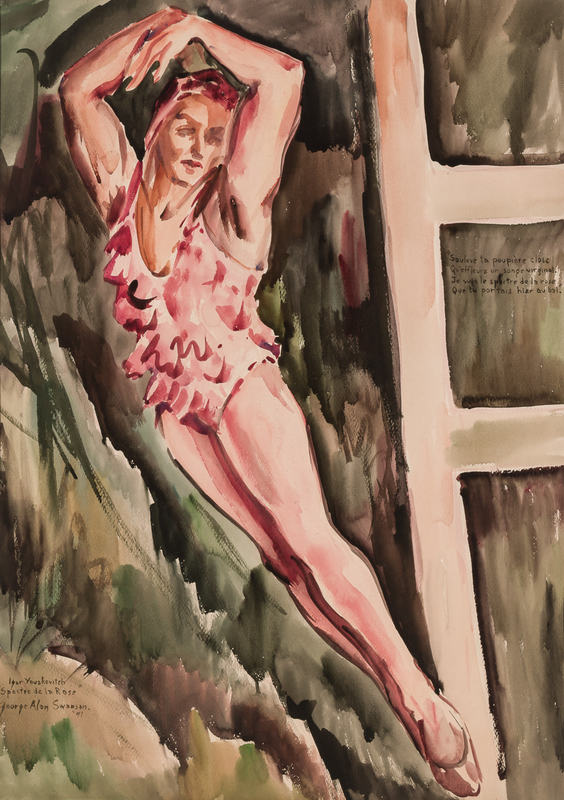 Swanson was noted for his aptitude for watercolor, apparent in these paintings. The paintings are priced to sell and are expected to attract the interest of dance aficionados. 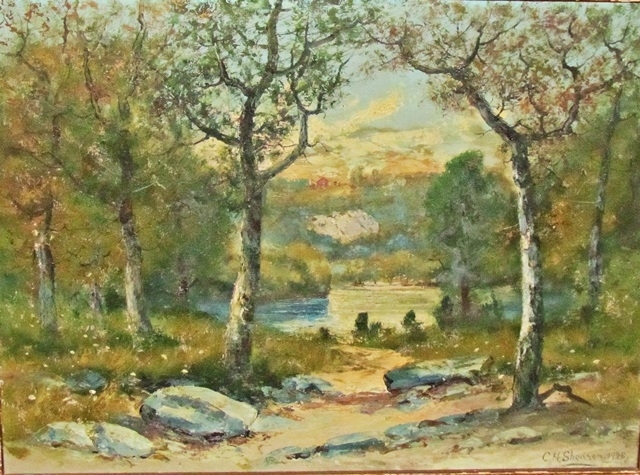 Also in the sale are works from the estates of Will Hutchins, Alfred Bricher and Pat Jensen. Visit www.shannons.com. Morphy Auctions’ petroliana and automobilia auction slated for Feb. 12, online and at the firm’s gallery in Denver, Pal., will feature many fine examples of these burgeoning genres, with estimates ranging from $2,000-$30,000 for the usual lineup of rare and beautiful porcelain and tin signs, single globe lenses, glass globes and more. But one lot jumped out from the rest with its fantastic pre-sale estimate of $100,000-$150,000. 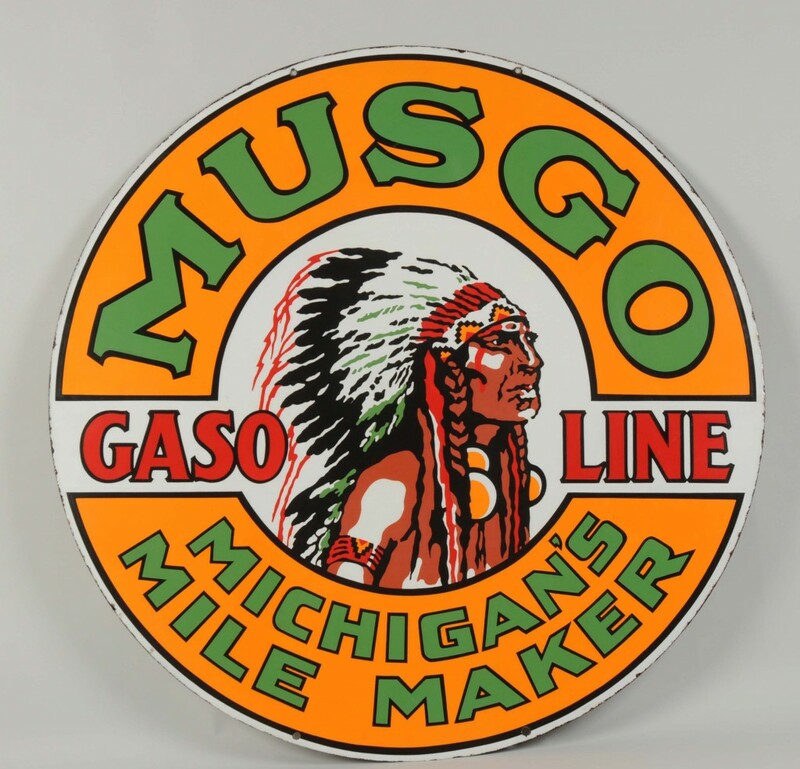 It’s a Musgo Gasoline “Michigan’s Mile Maker” porcelain sign with Chief logo. But what would make it deserve such a high estimate? According to Dan Matthews, Morphy’s resident petroliana expert, “When Musgo went out of business, a plumber purchased the warehouse and used most of the Musgo signs for septic tank lids. Septic tank fumes are one of a few things that can eat porcelain right off of metal. As such, Musgo signs in excellent condition are extremely rare. Around 1980, collectors started to research the location where the plumber had put in septic tanks and dug up several of the signs. This is one of those signs and it’s one of maybe seven in existence.” Visit MorphyAuctions.com. Jeffrey S. Evans & Associates’ two-session sale planned for January 27th and 28th, online and in Mount Crawford, Virginia, will be the firm’s annual Winter Glass & Lighting Auction, packed with an important and varied selection of 18th to 20th century American and European wares. The January 28th session will feature the Ellen O’Brien studio glass collection, with over 300 paperweights, as well as sculptures and other forms. Studio glass is the modern use of glass as an artistic medium to produce beautiful sculptures and three-dimensional artworks, such as paperweights. The stunning object you see here is a paperweight creation from Gordon Smith, who has been a full-time studio glass artist in Egg Harbor Township, New Jersey since 1982. He specializes in creating fine crystal lamp-worked paperweights and small sculptures, using realism to execute his choice of subject, which can range from a floral motif to a desert scene or aquatic environment. 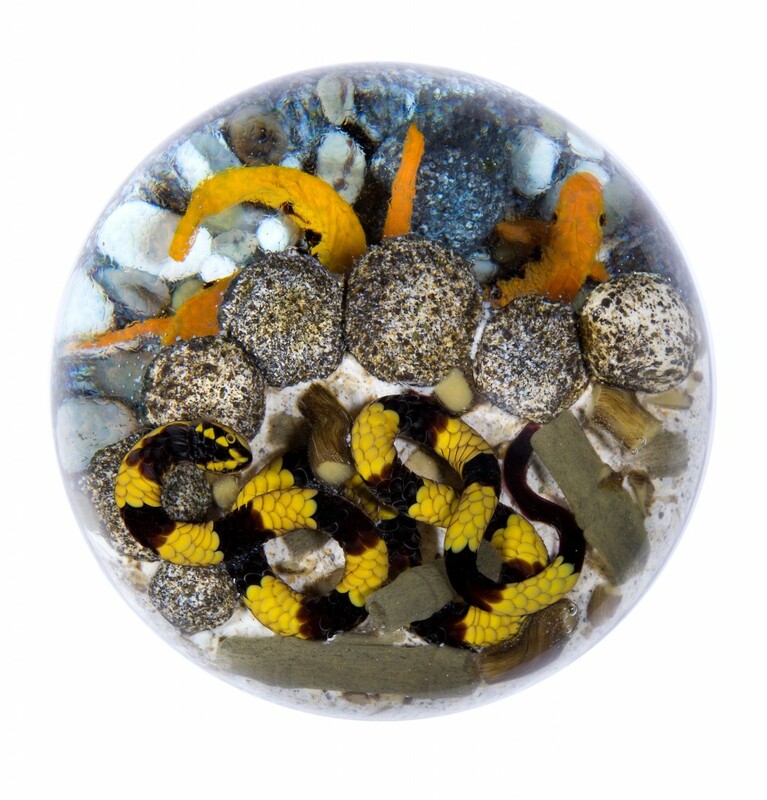 Today, Gordon is one of the few acknowledged masters in the art of paperweight making in the world. His work can be found in many public and private collections. Visit www.jeffreysevans.com. This Tiffany & Company tall case clock with elaborate Renaissance Revival style carved oak case attributed to R.J. Horner and having Walter Durfee movement with Westminster tube chimes, will be a featured lot at Case Antiques Auctions & Appraisals’ January 21st Winter Art Antiques Auction, online and at the firm’s gallery in Knoxville, Tenn. Think about that for a moment. This clock’s got it all: Tiffany, Horner and Durfee, all in one magnificent, time-keeping colossus That’s what you might call a tall case trifecta. A four-fecta, if you include Westminster. The late 19th century clock features a carved pediment crest with laurel, egg and dart, dentil and anthemion moldings over an arched moon dial and silvered face with gilt filigree overlay, with a face marked Tiffany & Co. (N.Y.); a glass waist door flanked by caryatids; a base carved in a cartouche design with applied high relief carved floral garland molding above canted serpentine carved corners; paw feet (front) and bun feet (rear). Care to guess the estimate on this 101-inch-tall baby? Actually, it’s a quite reasonable $14,000-$16,000. Visit www.caseantiques.com. Berks Community Television (BCTV), in Reading, Pennsylvania, will be bringing live auctions to television with the debut airing of a new show called Auction Action on BCTV on Monday, Jan. 30th, at 6 pm Eastern time. The program will be hosted by Bill Howze, owner of The Renaissance Auction Group in Reading, and host of the popular BCTV show All That Stuff. In the first hour of the show, Mr. Howze will explain how the auction works and preview featured lots. All bidding is online. People will be able to bid from anywhere in the world on their desktop or mobile device. Berks County residents who have BCTV in their cable package will be able to view the show live. Bidding will be driven through The Renaissance Auction Group website www.auctionhowze.com. The show will be fast-paced, averaging one item closed per minute. Some lots will be specific to Berks County. And, even though many items will be rare, with a real or perceived value, the starting bid for each lot will be just $10. “That’s to get the ball rolling and the bidding started,” Mr. Howze said. The first item will come up for bid around 7 pm. Visit www.auctionhowze.com.